The students from Jan Morgenstern’s Resource Room at Houghton Lake Community Schools will have new iPads to use when they return to school this fall. A grant from the Houghton Lake Education Fund in the amount of $900.00 will assist with the purchase of eight new iPad’s. The iPad’s will be used to allow the special education students to access educational math, reading and writing app’s and wi-fi enabled programs to reinforce and enhance their learning experience. The iPad’s are very adaptable to allow the students to practice and learn new skills at their present academic level. 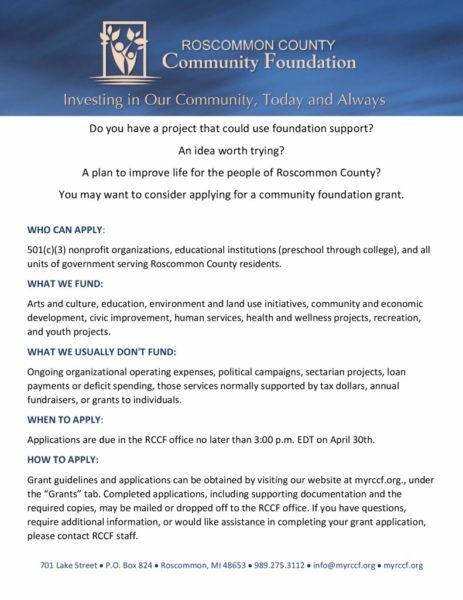 The Houghton Lake Education Fund is an Endowment Fund administered by the Roscommon County Community Foundation.